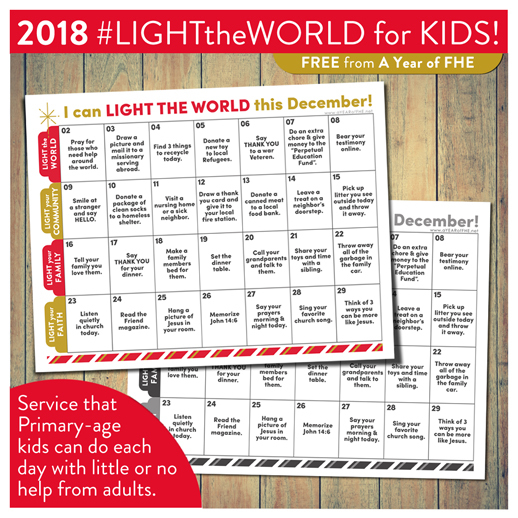 My Light The World Children's Service Calendars are always a popular Christmas tradition! It was so amazing for me to see my work and inspiration loved by so many families all over the world. I got emails from General Authorites saying they had given one to each of their many grandchildren, I got pictures from all across the globe, and I got many thanks from the sweetest readers ever (that's YOU!). PLEASE NOTE: I have provided this calendar as a free download for anyone to use and print, as many times as they want. I WILL NOT BE ABLE TO change the colors, change the fonts, email you a copy directly, make this file editable for you, change any of the daily prompts, or customize this file for you in any way. Please enjoy it exactly how it is. This year the calendar is a little bit different. The church made week-long areas of service, starting on December 2nd. I cahnges my calendar accordingly! There are still daily tasks for young kids to do, but they follow the weekly themes. CLICK HERE to see the official version of the calendar for adults. Your kids will love doing their own acts of service each day! Feel free to print as many of these as you want for friends, families, and Primary. But you may NOT alter this file in any way and offer it as your own download. PLEASE SHARE THE LINK, NOT THE FILE. Please tag me on social media as you share your photos of your families, primarys, grandchildren, and children using this calendar. It makes my heart burst with happiness and makes the time and effort I put into this freebie so worth it! Thank you SOOOO much! 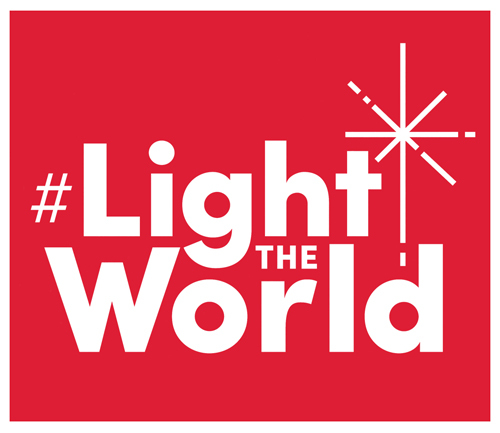 As a family we look forward to the yearly Light the World campaign and your children's version is perfect for this stage of our lives! Thank you, thank you, thank you!! I am so happy to see that you've once again put together the perfect calendar for use with the littles and am thrilled to use it with my Primary children! Thank you, thank you, THANK YOU for this calendar! We have used the past ones for our "Kindness Elves".These simply daily tasks make all the difference in our home. THANK YOU!!! Our Stake RS president posted the link to your page for this download. I was so sad to see your 'STOP' announcement. It breaks my heart to know that fellow Sisters in Christ are being so dishonest. May God bless you richly for your kindness in providing this idea calendar to us! Thank you but I’m having trouble opening the adult version. Any tips? I agree with the above posts. THANK YOU for your generosity in sharing your talents in this way to help us Light the World! Thank you for helping us to help our children light the world! I appreciate your generosity. Thank you for sharing this! We look forward to your calendar each year! Thank you for sharing this! I saw your post on Instagram. We are going to share it with our ward Primary kids on Sunday and are excited to hear how they share their light. I am so sorry some sisters have taken advantage of your talent and kindness in sharing. Know please that your work has added great joy to my Sunbeams/CTR 4 class over the last however many years I've been using you. Am thankful for your talent. Thank you for sharing this blog. This will be the first year that my family will be participating in Light the World. I would love to share your link on Facebook to get others interested. Thank you for taking the time to put this together and for sharing your talents with us! I love using this to get my little ones and my primary involved in simple ways they can. Merry Christmas! THANK YOU for sharing ! I am so sorry that folks don't clearly understand the rules, but I am glad you've made them SO CLEAR! May you have the finest of days ahead ! Thank you SO much! This calendar is exactly what I was looking for! You've made Light the World very feasible and less intimidating. Our family is amped for this. Thanks! Thank you for this calendar! You've made it even more doable for my kids. Thank you for choosing to share your talents with all of us, and in doing so making our lives this Christmas season a little lighter and brighter. You rock!!! Thank you so much for creating this calendar each year. This brought the Spirit into our home so much this Christmas season. My daughter looked forward to every task that she was given every day. It’s a tradition I hope to continue to celebrate for years to come ❤️.